Some 50 years after Joseph Smith claimed to be visited by God the Father and Jesus Christ, an event that launched the Mormon Church, another teenage boy began an inconspicuous Bible study in Allegheny, Pennsylvania, in 1870. The result was the establishment of a second major worldwide cult in the 19th century, known today as the Jehovah’s Witnesses. Officially known by several names — The Watchtower Bible and Tract Society of New York, Inc., The Watch Tower Bible and Tract Society of Pennsylvania, and the International Bible Students Association – the Jehovah’s Witnesses today boast more than 6.6 million active participants (known as “publishers”) in more than 230 countries, with nearly 100,000 Kingdom Halls, one of the largest publishing operations in the world, and an aggressive door-to-door “preaching” ministry. Joseph F. Rutherford, legal advisor to Russell’s organization, became its new president in 1917. He set a new date of 1925 for Armageddon, but when it didn’t happen, the charismatic and domineering Rutherford backed away from his prediction, claiming that his followers misunderstood him. Undaunted, he changed the name of the society to the Jehovah’s Witnesses, taken from Isaiah 43:10, in part to distance his followers from splinter groups forged by former, disillusioned members. He also escalated the aggressive door-to-door “preaching” that distinguishes Jehovah’s Witnesses today. 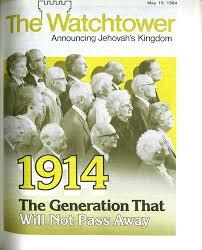 In fact, Jehovah’s Witnesses log more than 1.2 billion hours of “preaching” door-to-door each year. In an effort to rapidly increase membership, he proclaimed that only 144,000 people would make it to heaven. When Watchtower ranks swelled beyond this number, Rutherford announced that everyone who had become a Witness before 1935 would go to heaven (the “little flock”), while everyone who joined after 1935 would be among the “great crowd” who would not go to heaven but could live in an earthly paradise after Armageddon and the Millennium. Frederick Franz became the next president. While he would not permit the society to set any more dates for Armageddon, he insisted that persons alive in 1914 would witness this cataclysmic event. He died in 1992 at age 99. Successor Milton G. Henschel discarded the entire end-times scenario in favor of “new light” that made the “generation” of Matt. 24:34 apply to any generation that sees the signs of Christ’s return. Don Adams heads the organization today – a society that remains prolific in its publications and aggressive in its evangelism. The Watchtower, a semimonthly magazine that instructs the society’s members in faith and practice, is published in 158 languages with a circulation of more than 21 million. Awake!, designed for non-members, reaches 18 million readers in 81 languages. The society’s official Web site may be found at http://www.watchtower.org/. Jehovah’s Witnesses acknowledge that Charles Taze Russell was “the prime mover of the group” (official Web site), but seek to distance themselves from him and his teachings. Unfortunately, Jehovah’s Witnesses today still cling to Russell’s main false teachings: a denial of the Trinity; a denial of the deity of Christ and His bodily resurrection; a denial of the Holy Spirit’s deity and personality; a denial of hell as a place of everlasting punishment; and more. Jesus is Jehovah’s first created being. Jesus had three periods of existence. In His pre-human existence he was called “God’s only begotten Son” because Jehovah created him directly. He then used Jesus to create all other things. He also had the personal name Michael the Archangel. The second stage of Jesus’ life was on earth as Jehovah transferred his life from heaven to the womb of Mary. Jehovah’s Witnesses are adamant that this was not an incarnation. Jesus became Messiah at his baptism, was executed on a torture stake, and his humanity was annihilated. He then began the third stage of his life, being raised an immortal spirit who returned to heaven once again as Michael the Archangel. He returned invisibly to earth, but now rules from heaven, and “very soon now, he will manifest his rulership over our troubled earth” (Knowledge, p. 41). Jesus is not God. Jehovah’s Witnesses teach a type of polytheism with a doctrine of “two gods.” The say Jehovah is the Almighty God who created Jesus, and Jesus is the mighty god who created everything else. This is simply a modern version of an ancient heresy. Arius, a pastor’s assistant in Alexandria, Egypt, taught that Christ was a created being. He captured a strong following, which necessitated the Council of Nicea in A.D. 325. The Holy Spirit is not God. Jehovah’s Witnesses teach that the Spirit is an “invisible act or force” that Jehovah uses to inspire His servants to accomplish His will. Put simply, the Holy Spirit is like electricity, according to Watchtower reasoning.